The establishment of a new plant in culture is greatly affected by the success of the decontamination process which is required to produce sterile material from which the clones can be grown. The decontamination process is much more likely to be successful if there is a low level of bacteria and fungi on the plant material to be cultured when it reaches the laboratory. The numbers of bacteria and fungi on the tissue to be cultured can be reduced by doing the following with your plant to be cultured. 1. Spray with an insecticide a few weeks prior to culturing. 2. Spray with a fungicide a few times over the last 6 weeks prior to culturing. 3. Keep plants to be cultured in the cleanest, insect proof place in your greenhouse. 4. Provide good air movement and keep the plants foliage a little dry. 5. Clean up the plant. Please contact the laboratory prior to sending any plant material for cloning. 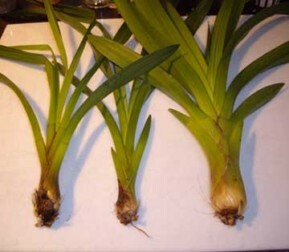 The type of plant material needed for cloning varies greatly depending on both the plant genus and species of the plant. When we know that plant material is on the way it allows us to make fresh culture medium to give the best chance of success of initiating your cultures. 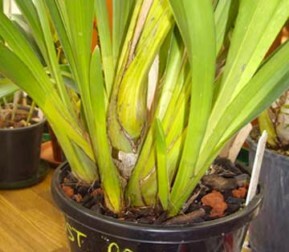 Cymbidium plant with a new lead, front left ready for cloning. Cymbidium leads ready to be cloned.